HMH Books for Young Readers, 9780547550022, 288pp. Big Audrey is a girl . . .
with cat’s whiskers . . .
and sort of cat’s eyes. 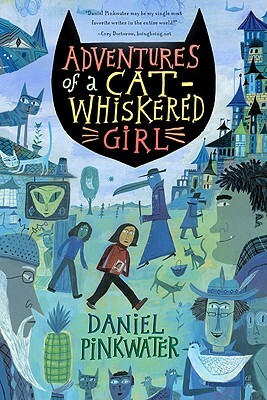 But, is there an other cat-whiskered, sort of cat-eyed girl? Big Audrey waves goodbye to her friends Iggy and Neddie, Seamus, and Crazy Wig, in Los Angeles and hitches a ride with bongo-playing-while-driving Marlon Brando across the country to Poughkeepsie, New York, city of mystery. She finds she has questions needing answers—and a bit of inter-plane-of-existence traveling to do. Big Audrey and her telepathic friend Molly zigzag off on an incredibly strange and kooky adventure, and solve the mystery of the cat-whiskered doppelganger.